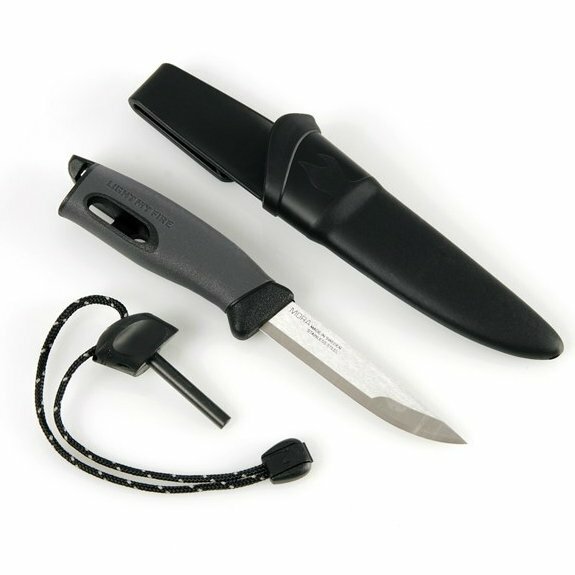 Swedish FireKnife has a blade of hardened Sandvik 12C27 stainless steel and a handle with a high friction rubber grip which is comfortable, easy and safe to use. Profile-grinding makes the blade fine enough to ease out splinters and the back of knife has been ground to work perfectly with the Swedish FireSteel®. The Swedish FireSteel® is durable (3000 strikes), works equally well when wet and creates a 5,400° spark. 1) Remove paint on new fire-starter with the back of knife. 2) Pull the back edge of the knife slowly and firmly down length of fire-starter. 3) Sparks easily ignite a stove, TinderDust, BBQ, paper, dry grass, birch bark or any other prepared tinder. Product Review: Best knife I’ve had in this price range. In fact it’s better than other knives I’ve had that cost 2 or 3 times as much. This is a real deal. Product Review: Holds its edge fire starter easily works as advertised. Lightweight (good for backpacking) . . . seems ideal for hunting, camping, fishing, etc. A good item to keep with survival gear or kit.